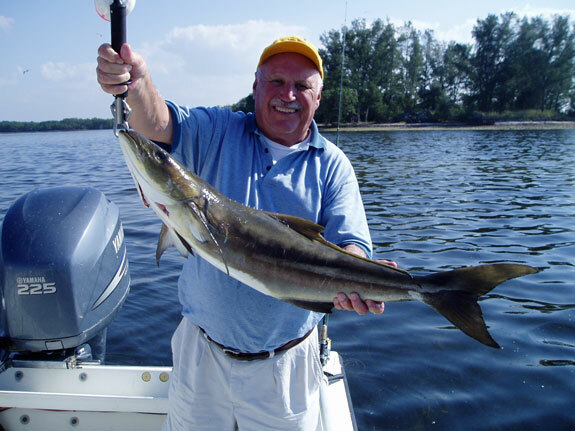 Cobia run in good numbers off Anna Maria Island and adjacent waters. Cobia look very much like sharks in the water. They are usually brown or gray above, whitish on the underside, with a dark stripe running from the gills to the tail. They have very sharp finlets on the dorsal surface which can rip your skin apart if not handled cautiously. The size is common from 15-40 pounds and have been caught off the Anna Maria and Longboat Key reefs up to 90 pounds. Cobia are very strong and have unpredictable fight. They have great stamina and can make large runs. Cobia are notorious for wrapping lines around buoys and wreck structure. Capt. Tom Chaya uses medium to heavy tackle with 30 pound "powerpro" line to clear most obstructions. When gaffed "green" (not tired) Cobia can and often do smash up the inside of your boat. They will eat most live baits such as sardines, crabs, shrimp and mullet. A blue runner has the most success on monster cobia. They are an excellent eating fish with dense white meat when properly cleaned.